Mordian 7th Regiment: 40k Deathwatch - Squad Crull and Squad Donatus complete! 40k Deathwatch - Squad Crull and Squad Donatus complete! While I had the painting servitor subroutines running, I finished up the two Veteran squads that came in Overkill and Death Masque. They were a fair way towards the finish line already, but even so it was a good three or four hour session to pick out all the little details and go back to catch the little stuff I'd missed on them in the abortive batch painting process. First up is Squad Crull, using the new Deathwatch kill team sprues. I think these are some of the best sprues GW has come out with, definitely the kitbasher's dream with all the bits! I was forced to arm them as shown in order to use them as part of the 'official' kill team, and while they certainly look neat it strikes me as a bit of an awkward array of armaments for tabletop play. Definitely looking forward to building a few more kill teams armed a bit more sensibly. 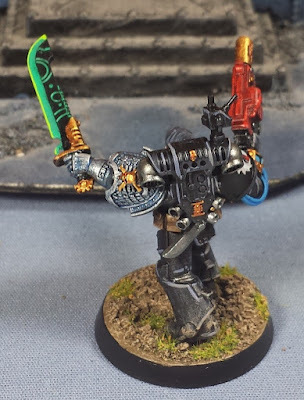 I was pretty pleased with how Sergeant Crull's Xenophase Blade turned out, it's a fun bit of kit and shows some good ol' Imperial hypocrisy. I'm planning on carrying that idea through and do a Radical Ordo Xenos Inquisitor with some further Xenotech and perhaps a Jokaero to accompany the Deathwatch force. Should be fun! Next up is Squad Donatus, the Veteran squad that is part of Kill Team Cassius. These models also suffer somewhat from the scattershot armaments coupled with the mono-pose nature of the Overkill models. That said, for what they are they definitely were a blast to build and paint - they exude a bespoke sense of character that is a little hard to capture with the multi-pose models. Next up are the characters and specialist models from the two Kill Teams, then on to the vehicles! Never fail to impress with the speed of your painting and quality of output. These look cool - right out of the Deathwatch rpg illustrations. What in the hell is the heavy bolter-heavy flamer-thing?!?! Infernus Heavy Bolter. Deathwatch exclusive weapon. It’s beautiful. As a fan of the Deathwatch and the Salamanders, it’s a dream come true. Looks good chief. 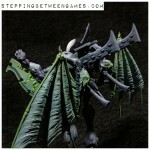 The blade stands out as some excellent freehand. +1, really great job on the xeno blade. IT looks awesome! Loving the edging on that Xeno blade as well. Top notch stuff! I wonder if the scattershot nature of the armaments on Deathwatch models might signal the dawn of a new type of play style for 40k. You see a lot of 2000 point lists that spam a lot of the big stuff, but maybe smaller, more Killzone-style games aren't the answer? More and more, I've been delving into the Iron Sleet site and its wonderful narrative-focused stuff, and wondering if something like it would be possible on this side of the pond. Food for thought! Great work as always Mordian! Again, the energy blue and red weapons really help make them pop. I too think it's an odd mix for a unit, but it makes them look cool, and as #2501 said, maybe there is more small unit games coming where this would work really well. @Dai: Thanks very much! Has me hankering to break out the Deathwatch RPG and run a one-shot for my current Rogue Trader RPG group! @Da Masta Cheef: It's the thoroughly ridiculous "Infernus Heavy Bolter", an Assault 3 Heavy Bolter (due to suspensors) with an underslung Heavy Flamer. Swiss army heavy weapon! @Col. Hertford: I appreciate it! @Greg Hess: It's definitely an eye catcher! Thanks! @#2501: Aye, I have a feeling that they would really shine in a Kill Team/Zone Mortalis type game where they can be run as more individualists than they are as a squad in a 40k mission! @Joe B: Thanks! They definitely needed some strong colors to pop against all the subdued black and silver. I appreciate all the kind words, everyone! Cheers! You are a MACHINE! So speedy. I envy you. 40k Deathwatch - Kill Team Cassius complete! 40k Deathwatch - Vanguard Veterans painted!